On May 26, 1888, the Boston Daily Globe reported the death of a young Harvard student named Frank Mills. The front page headline read: “Fatal Opium.” According to the story, having decided that life at Harvard would not be complete without the experience, Mills and three fellow students had ventured into Boston with the hopes of securing some opium. Following suggestions from their classmates the foursome sought out a man known as Nicholas Gentleman who sold opium in the South End. The boys had “refused to go to an opium joint,” as they feared a police raid, but told Gentleman if he would come to Harvard they would “make things all right for him.” He readily agreed after several assurances that Mills was “an old hand at smoking.” That evening Mills continued to claim he was a frequent smoker leading Gentleman to oblige his numerous requests for another pipe. Mills and the others soon became ill and by early morning the group suffered in obvious agony. Medical doctors were summoned, yet the group took great care to keep the opium smoking quiet. In the end, all but Mills recovered, their secret was revealed, and Gentleman arrested. Setting aside any debate on whether opium smoking could prove fatal in this circumstance, I want to use the death of Frank Mills to illuminate the ways in which prohibitive state laws and municipal law enforcement proved influential in shaping the character and context of opium smoking prior to federal regulation, particularly in areas with relatively small Chinese immigrant populations. In this instance, the city of Boston serves to demonstrate the impact of the first anti-opium smoking law in Massachusetts by revealing how it altered both the habits and demographics of white smokers, especially those previously found lounging in Boston’s “Gilded Dens.” By analyzing descriptions of opium smokers before and after the 1885 law we get a sense of how both the practice and the practitioners were noticeably altered by legislation and enforcement that emerged in response to its rapid proliferation among otherwise socially respected whites. An investigation by the city’s Health Commissioner expected to find only large numbers of Chinese smokers. 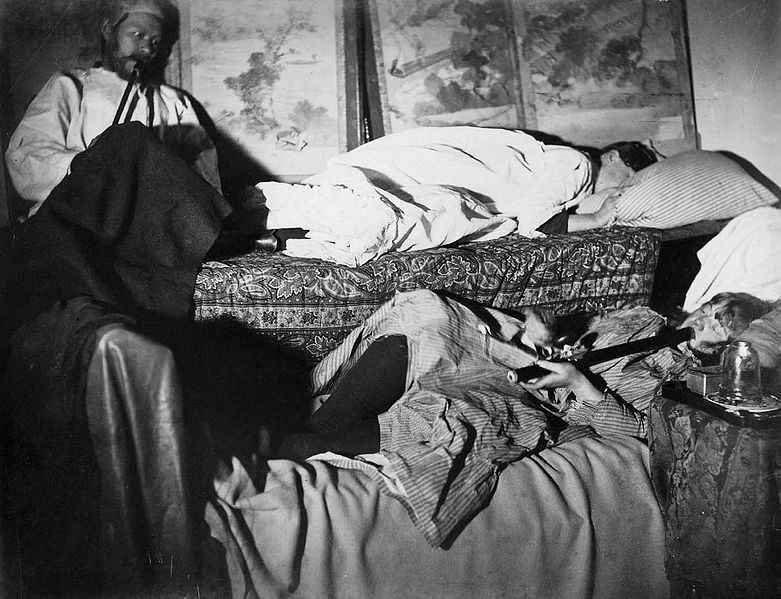 Yet one of the city’s largest opium den held just one. Instead, it was crowded with well-dressed whites, to the extent that “there was such an air of respectability about the party and such a decided atmosphere of disrepute about the place that the incongruity was the most startling part of the scene.” Overall, the investigation found that many opium dens were “remarkably clean and neat” while others were “decidedly unhealthy,” noting an apparent division between two classes of smokers. The volume of reports on opium smoking tapered significantly as enforcement of the 1885 law continued. The descriptions and arrests that did appear featured greater numbers of Chinese smokers than before and far fewer whites of any significant social description. For example, an 1888 police raid on 38 Harrison Street netted some thirty-six Chinese men on charges of gambling and opium smoking. Among these “Devotees of Fan Tan,” police found only two whites – the legal wives of two arrested men. Just a few years earlier a raid of this magnitude would have almost assuredly found many more white smokers. Given the fervor of the city’s most prominent newspaper over the previous three years, this certainly suggests a decrease in opium smoking, or at least a decline among the prominent whites who were always the intended target of the Globe’s ­campaign. The paper’s waning interest thus suggests that white smokers had altered their habits and were less likely to be exposed by reporters or raided by police. This brings us back to the death of Frank Mills. 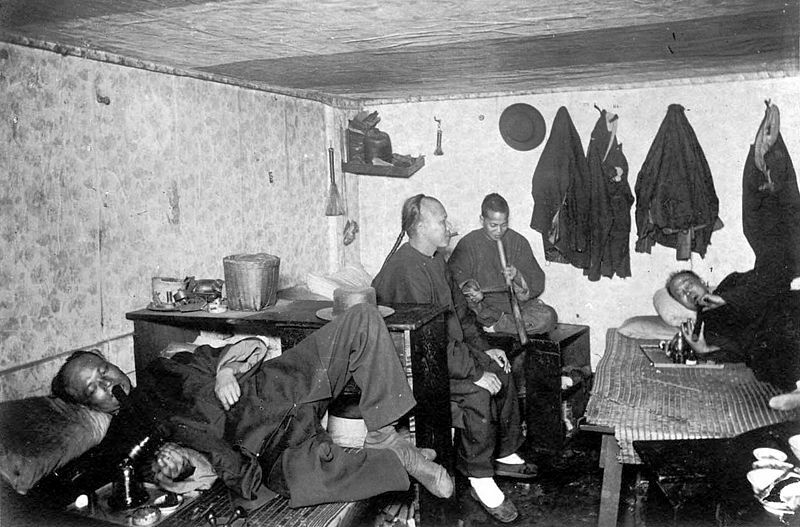 His story exemplifies the extent that whites, especially those of socially respected backgrounds, had removed themselves from opium dens all together, and encapsulates the changes brought on by the state’s first anti-opium law. Where just three years earlier “respectable,” “fashionable,” and “well dressed” American born men and women were frequently found in Boston’s opium dens, people of similar social standing such as Mills and his Harvard classmates were now avoiding them altogether. Though first time smokers they obtained information about where to find opium from their schoolmates. While this may signal the ease with which opium was still obtained by white members of the middle and upper classes, it may also, as the boys suggested, have simply been a Harvard tradition that had not yet died out. On the whole, I suggest it signaled a shift toward a more general renunciation of opium smoking by socially respected whites, leaving only a few remaining smokers among the young, adventurous, or celebrity types. While this characterization appears quite sound as applied to areas in the West and cities with sizeable Chinese populations such as New York City. The story in Boston appears much different. Significantly, if opium smoking spread from the small immigrant Chinese population to the white “underworld” and then on to members of the middle and upper classes, the transmission across the Boston’s social spectrum was both rapid and pronounced.By most contemporary accounts, opium smoking transitioned from a Chinese vice to a widely documented problem among whites of all social classes in years rather than decades. The equally swift implementation and enforcement of Massachusetts’s first anti-opium law then significantly reduced the number of whites from socially respected backgrounds that were documented, implicated, or arrested for opium smoking while the number of Chinese rose. Surely, some whites of the middle and upper classes continued to smoke in the relative safety of their homes and/or in ways that went undocumented or undetected – a regular evidentiary problem for drug historians. Nevertheless, it seems clear that Boston’s middle- and upper-class white smokers abandoned the practice in such a way that the law effectively secured the habit’s status as a vice almost wholly composed of smokers drawn from Chinese immigrants and the white underworld. Whether the same can be said of events that unfolded in the wake of state and municipal laws enacted elsewhere in the country remains to be seen, but Boston may stand as an example of the ways these impacts can be understood in new ways.